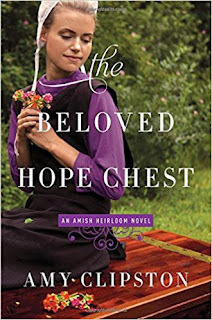 The Beloved Hope Chest is the fourth installment from Amy Clipston's Amish Heirloom series. In this final book of the series, a reader will find the heartbreaking story of Mattie Fisher. Mattie endures great loss when she loses her husband while she is carrying his baby. Grieving terribly and lonely, she receives a proposal from her childhood friend, Leroy. She accepts and they soon marry. The two faces more struggles they could ever imagine. The Beloved Hope Chest is one of the most emotional Amish reads I have ever read. One of the losses the characters endure, I was able to relate to and I quickly needed to grab the tissues. Amy Clipston perfectly writes how true the emotions a person with experience during those times. In addition to the emotional parts, there are others that were tender and sweet. A wonderful story of how to continue to keep the faith in God and learn to forgive, letting go, and moving on.